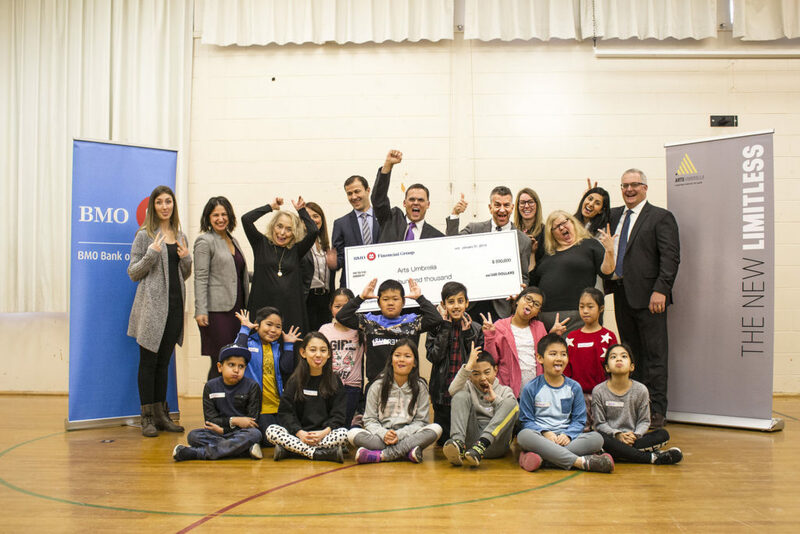 On January 31, 2019, BMO Financial Group (BMO) joined Arts Umbrella at Lord Selkirk Annex School in Vancouver to announce a major new commitment in support of the re-construction of Arts Umbrella’s new home on Granville Island. A major sponsor since 1988, BMO has made a $500,000 contribution to Arts Umbrella’s Building Project, helping to ensure thousands of young people can fully express themselves through the arts and share their passion with the world. BMO also announced a three-year title sponsorship of one of Arts Umbrella’s most vital community programs—the Van Go and Stage Coach Program—with a financial commitment of $75,000 per year. For more than three decades, BMO has supported Arts Umbrella’s mission through regular contributions to its bursary fund and community programs, as well as the Arts Umbrella Dance Company. In 2012, BMO also played a crucial role in the establishment and development of Arts Umbrella’s Surrey locations, helping to bring high-quality arts education to this fast-growing community. The BMO Van Go and Stage Coach Program offers free visual arts and theatre workshops to the children and communities in Metro Vancouver that would most benefit from them. Children ages five to 13 are given the opportunity to participate in 90-minute arts workshops. Arts Umbrella works with local school boards and school administrators to identify the communities most in need of these workshops. Over 23 schools participate in the program every year, ensuring equitable access to the arts for 3,450 young people in 138 classes. We are projecting to open our doors and begin programming in 2020.